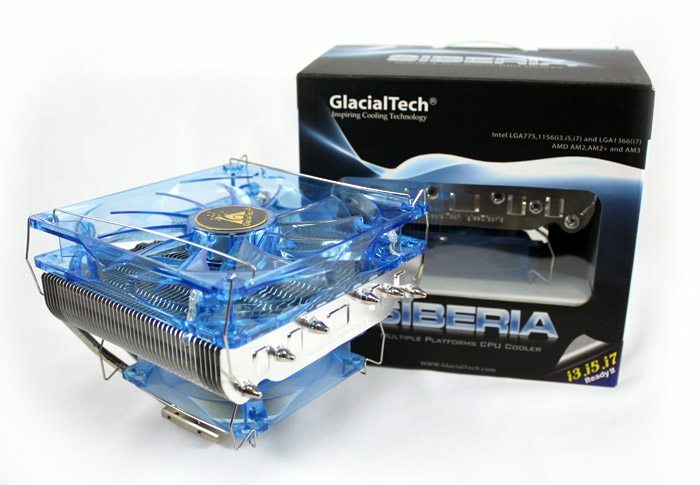 It has been a few months since I last visited with a GlacialTech offering and when they asked me to take a look at the Siberia Cooler, I was hopeful. Hopeful that they would be able to win on all fronts this time. The Siberia aims at a different target than the Alaska did, the Siberia is designed for quiet cooling, lots of cooling, but uses a design that is no taller than the Nexus FLC-3000 R2. Horizontal heatsinks are perfect for applications where height is not an option, such as home theater PC’s. Siberia is cold, let’s see if this cooler cools. 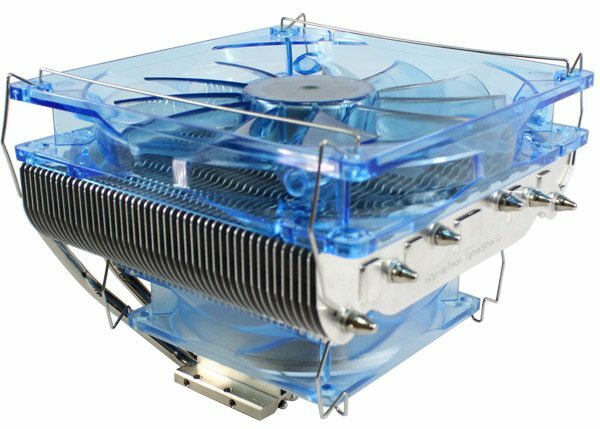 The Siberia’s design looks more like a motor than a CPU cooler! Once again we are greeted with GlaciaTech’s “Entering Bearing” fan design. This type of fan is supposed to leverage additional oil capacity within the fan bearing and implements a better seal than traditional sleeve bearing fans. This implementation is supposed to allow a longer usable life time by way of reducing friction further. 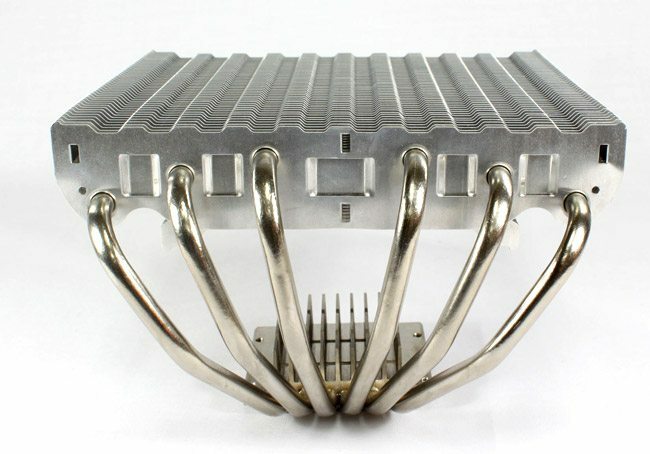 The heatsink features not just one fan, but two; and these two fans are arranged so that they both move air in the same direction, down. The upper most fan is a 140mm, it moves 72CFM, and produces 33 dB(A). The bottom fan is a 92mm fan that pushes 19CFM at 19 dB(A). This makes the Siberia a bit louder than the Nexus FLC-3000 R2, but it moves more air. The Siberia features the same fan mounting design as the Alaska, but this time around the fans came installed already. The mounting design uses clips that look like cleverly bent paperclips held in place by the cooling fins. They are annoying to install. Pancaked between the two fans are 46 fins with a unique design to them, they all have 5 raised notches to help keep the air flowing. 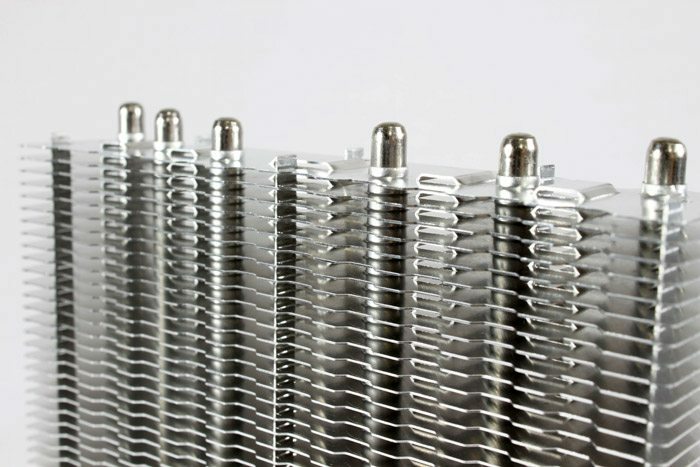 The cooler itself sports 6 separate heatpipes navigating their way through the fins, the Siberia measures 146x150x120 (mm), and weighs in at 620 grams. Like the FLC-3000 R2, the Siberia features fins attached to the base plate to encourage heat dissipation.